Regular readers of this blog may recognize the name Charles H. Cleaves as the founder of the Rockport Photo Bureau, the company that produced many early postcards of Rockport. (Click on the Rockport Photo Bureau tag in the right-hand column to see the postcards of his that I have posted so far.) Cleaves founded the company in 1907 and ran it until his death in 1937. His daughter, Virginia Cleaves Little, continued to run it at least into the 1940s. The information I have about this photo, which is a 4×5 inch glass negative (#A9445-063): Charles H. Cleaves Junior, and Mill standing in Mill’s yard, Rockport, circa 1900. I believe it was taken on Granite Street, with Sandy Bay in the background. Mill was the nickname of the woman, and I guess she lived right there. As for Charles H. Cleaves Jr., I surmise from the negatives I own that he was involved in the granite industry (photos of a few granite structures in the Northeast, such as the Brooklyn Bridge), went to Harvard (photos of Harvard buildings and a dorm room), and loved to photograph. He lived at the top of Pasture Road, which has a granite post at its intersection with Granite Street inscribed with the letters CC (Charles Cleaves). I can add to that information that Cleaves was a lawyer. 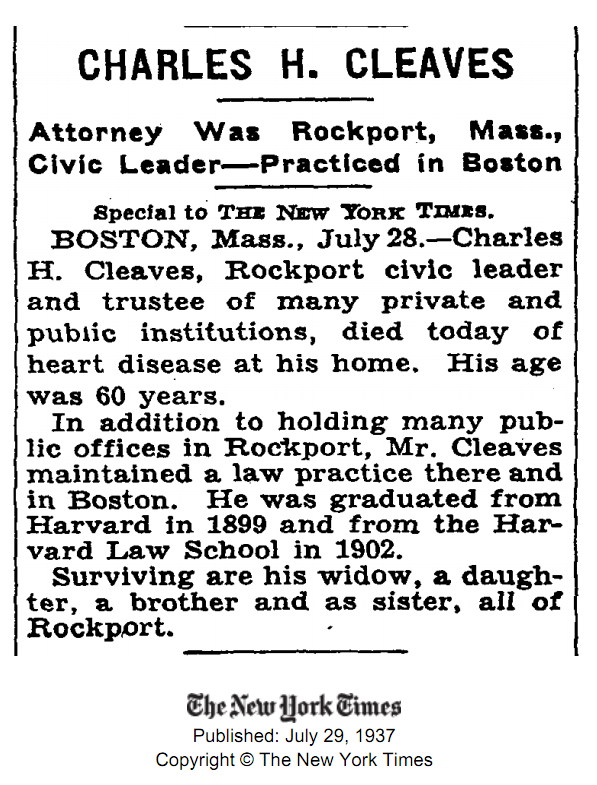 As his obituary from the New York Times says, he graduated from Harvard in 1899 and from Harvard Law School in 1902. The photo above, then, would have been taken while he was in law school and well before he started taking his own photographs professionally. Fred says that he has 259 Charles Cleaves photos in his collection. The Sandy Bay Historical Society also has a large collection of his photos and postcards, as well as his original glass-plate negatives. This entry was posted in Uncategorized and tagged Rockport Photo Bureau. Bookmark the permalink. Millie was a cousin who was 4 years older than Charles. Do you happen to know where was the location of this photo? Yes Bob I do. I could be wrong but it sure looks to be 2 houses going toward Rockport ocean side. 117 Granite Street. Charles’s wife Clara lived there for a while. He might have too. . I see the wall. It looks to be this photo was taken on the close edge of 84 Granite Street. Good eye! Now I recognize that wall.